Arisaig has been successfully trading for 4 years and attracts an impressive level of guests from foreign tourists, business people and many other visitors. Our client has a good reputation and as a result has many regular guests who book direct. The average price for a room per night, including a hearty Scottish breakfast is £75. 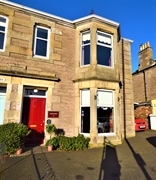 Arisaig Guest House is situated in the fair city of Perth, which has long been called the gateway to the Highlands. The historic city of Perth sits on the river Tay and attracts lots visitors who come to see many of its attractions such as the wonderful Scone Palace, Balhousie Castle and Hunting Tower Castle. There is also a fabulous array of fantastic restaurants, bars and cafes, all a short walk from Arisaig in the bustling city centre. There is a large concert hall and a delightful Victorian theatre which attracts many visitors and again is a short walk from Arisaig. Perth council are also very active in promoting Perth and organise many successful events to attract visitors and show case this wonderful city.